Michelle Morgan’s schedule has cleared long enough to talk with me about her new book, The Mammoth Book of Hollywood Scandals. As a writer, I can’t see how she keeps it all together. She has two or three books going at the same time, in addition to being a wife and mother. As you will see, Michelle’s eager to talk about all of it. Fasten your seat belts! Michael: I’m out of breath trying to keep up with you. Is it Marilyn, Carole, or Thelma you’re working on these days? Catch me up. Michelle: Ha! Yes I get out of breath with it all too. I’ve never been so busy in all my life, but I’m so grateful and happy. Who needs sleep anyway?! Well, let me set you straight about what I’m up to at the moment…. I’m working on a new Marilyn book with a lady called Astrid Franse. She has an archive of items from the Blue Book Model Agency, which is where Marilyn was signed to when she was a young model. We have come together and will create a book about Marilyn’s modelling career, and the friendship she had with the agency boss, Emmeline Snively. The book will cover the years 1945-1950 mainly, but will also explore what happened to Miss Snively after Marilyn became famous. There is a lot of information out there about Marilyn’s modelling career, and I’m hopeful that we can put together a great book. All being well, it will be out in 2015. I’ve just finished working on the first part of a secret project which I’m not allowed to talk about yet (and which is really killing me because I love to talk!). It is a terrific project and is one of the hardest, but most enjoyable things I’ve ever worked on. 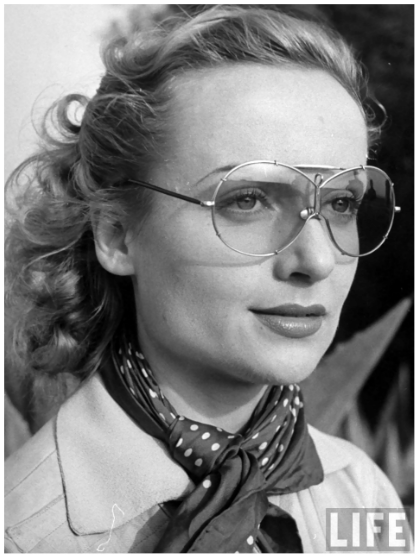 I’m also working on a book about Carole Lombard which I am hoping to see published as a glossy hardback, sometime in the future. 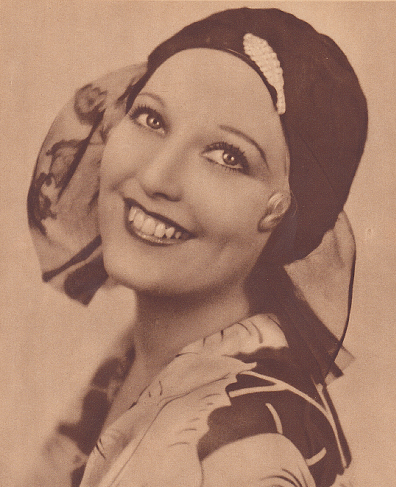 I’ve done all of the research and written around 20,000 words, so I’m certainly getting there, but I’ve had to put that project on hold for a little while because of the book I’m writing about Thelma Todd! Michael: Talk a little about the book you’re writing about Thelma Todd. Michelle: Yes, I’m very excited to say that I’ve just been commissioned by Chicago Review Press to write a book about Thelma Todd. This book means the world to me because I’ve wanted to write it for four years, and now I finally can. I have to have it finished by September 2014 and it will be published in December 2015, in time for the 80th anniversary of Thelma’s death. Michael: Tell me a bit about your interest in Thelma. Can you share any tidbits about your theory surrounding her mysterious death? Michelle: My interest in Thelma started when I was working on the paperback revised edition of my Marilyn Monroe biography, Marilyn Monroe: Private and Confidential. I came across the name Pat Di Cicco who was associated with Marilyn in the early days of her career. She received a letter from director Elia Kazan, telling her to stop hanging around him, and I was intrigued as to why he would say that. I started to do some research and, of course, came up with the name of Thelma Todd, because he was once been married to her. I had heard of Thelma before but knew nothing at all about her, so to find out that she died in her garage, under mysterious circumstances, was something of a revelation and I was completely hooked on her story. 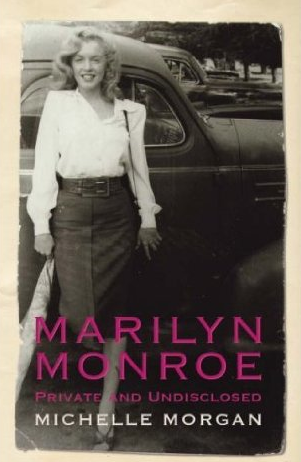 I started researching her while still working on the Marilyn book, and found all sorts of documents that were really interesting in my quest to discover the truth about how and why she died. I also found a gentleman who had done a lot of research into her life and death in the 1980s, and he helped me a lot with rare photographs and information. I do have a theory about how Thelma passed away, and why it happened. But it’s a secret, so I’m not allowed to tell you! You’ll find out when the book is released though. Only two years to wait! Ha ha! Michael: The Mammoth Book of Hollywood Scandals is being released in the United States this month (early December). It’s a whopping 512 pages. You cover everyone from Fatty Arbuckle to Michael Jackson. I guess I learned about some of the early Hollywood scandals reading Hollywood Babylon, which we know is riddled with inaccuracies. How were you first introduced to scandals? Michelle: I was definitely introduced to old Hollywood actors and actresses through my grandpa, who was a big film buff. He could watch a movie and tell you every actor or actress who was in it. He really was amazing and I still miss his insights into the good old days of Hollywood. I became a Marilyn fan in 1985 and, of course, some of her life (and certainly her death) involved scandal, so I guess you could say I was properly introduced to it that way. Then there is Madonna, who I have loved since 1984. She is no shrinking violet in the scandal department, so I learned a lot from her, too! I think being a Marilyn fan leads you to other stars and therefore other scandals. I first learned about Jean Harlow because of Marilyn (she was a fan of Jean’s), and many other stars’ stories, too. Michael: Reading Hollywood Scandals reminds me why I often feel like I am running into ghosts when I’m out in Hollywood. The town holds a lot of tragedy, doesn’t it? What do you feel are its most well kept secrets? Michelle: I think there are probably many secrets that we still don’t know, because the studios went out of their way to protect their stars, and cover up all indiscretions and naughty behaviour. Look at Clark Gable and Loretta Young. They had a child together, and yet while it was the talk of the industry, it never reached the press at all. The child was sent to an orphanage, and Loretta then pretended to adopt her, therefore making herself a hero, rather than an unwed mother. Gable didn’t have anything much to do with the child at all, and only met her once or twice; never once telling her the truth about her parentage. This story is unbelievable and yet it happened and it was successfully covered up. I truly believe that there are hundreds – maybe even thousands – of scandals and secrets we still haven’t heard about. For instance, the case of Patricia Douglas, who was raped in the parking lot of an MGM event, was swept under the carpet for years, until biographer David Stenn found out about it and brought it to the masses; giving Patricia a chance to clear her name and tell her story. That story is in my Hollywood Scandals book, and it is one of the most heart-breaking and infuriating stories in there. The poor girl. The whole experience of what happened to her during and after the event moulded her entire life. What an absolute tragedy. 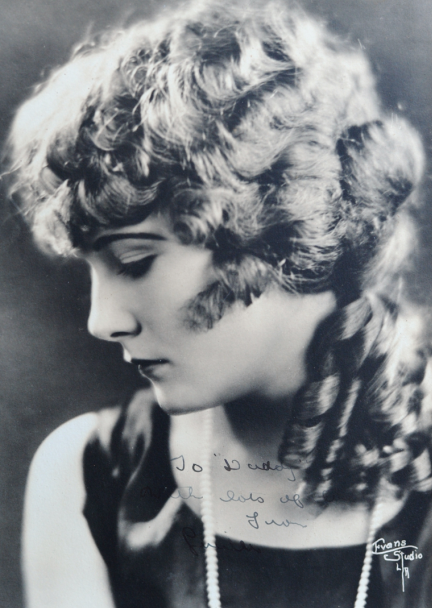 Lucille Ricksen signed this portrait for her father. Michael: That is a haunting story. When I wrote Dangerous Curves atop Hollywood Heels, I had trouble letting go of poor Lucille Ricksen, whom you write about in Hollywood Scandals. I felt that she was so abused by the motion picture industry. After writing Hollywood Scandals, is there one story that sticks with you as being particularly troublesome or sad? Michelle: I agree about Lucille. It was your wonderful book that made me want to learn more and write about her in my own book. I find it very disturbing that she was just in her early teens when she died, and yet she had been in movies playing adults for such a long time. And the photos she posed for; aged just five and six, with nothing but a little scarf protecting her dignity. Good grief, the girl was a baby. How on earth was this allowed to happen? It is a very, very upsetting story in every single way. In terms of sad and troublesome stories that I researched; well Lucille was one for sure, but Roscoe ‘Fatty’ Arbuckle really did upset me. The poor man was innocent and yet forced to go through three trials to prove it. In the end, the jury apologised to him because they were so disgusted that it had happened at all. He lost his career and his reputation, while Virginia Rappe (the girl at the centre of the scandal) lost her life and has had the most awful rumours made up about her since. The whole thing was just terribly sad and disturbing. I finished writing the book a year ago, but poor Roscoe has stuck with me for a long time, as his story is just so tragic and upsetting. Michael: I’m curious why you didn’t include a chapter on the William Desmond Taylor murder? Michelle: I really wanted to include him, and actually had him on my list of people that I wanted to talk about. However, after doing Roscoe ‘Fatty’ Arbuckle, and realising just how huge that chapter was, I knew that the Taylor murder would be even bigger, so I had to leave it out. My publisher was very firm in saying that I had to write about modern day stars, too, so I had to make sure I had a good selection, and two huge 1920s scandals would have probably been too much. The Taylor murder is definitely one I am fascinated by, however, and I have a number of books about it in my collection. Maybe if I do a sequel, I can include Taylor in that one! Michael: I am fascinated by locations around Hollywood that go back to the early days of filmmaking. You write a interesting chapter about the “Suicide Apartments,” where two entertainment personalities ended their lives. The location was 1735 N.Wilcox Avenue. Are the apartments still there or have they gone the way of the wrecking ball? Michelle: Well looking at Google maps (I’m addicted to that site! ), I’m not sure. There are many apartment blocks on that street, but whether or not they are from that era is a bit of a mystery. I have always been intrigued with locations, too, and whenever I’ve been to Los Angeles, I’ve always gone in search of Marilyn sights, and many others. It’s fascinating to me, but also depressing when you discover that something as important as the Taylor house is now a car park. That really upsets me. Michael: Your first book, as I recall, was a book about locales involving Marilyn Monroe. You also did a biography on her life. What is it about Monroe that still fascinates us? Michelle: I think about this a lot. To be honest, I think there’s no correct answer. She is different things to different people, so no-one will have the same answer. For me personally, she fascinates me in many ways, but it is her natural personality – the person she was under the character of Marilyn Monroe – that really interests me. She played the part of Marilyn, the glamorous movie star with the bright red lips, but in real life, she was most happy wearing a pair of slacks and a top; no make-up and her hair un-styled. I love this aspect of her and I don’t think that her true personality gets enough attention. 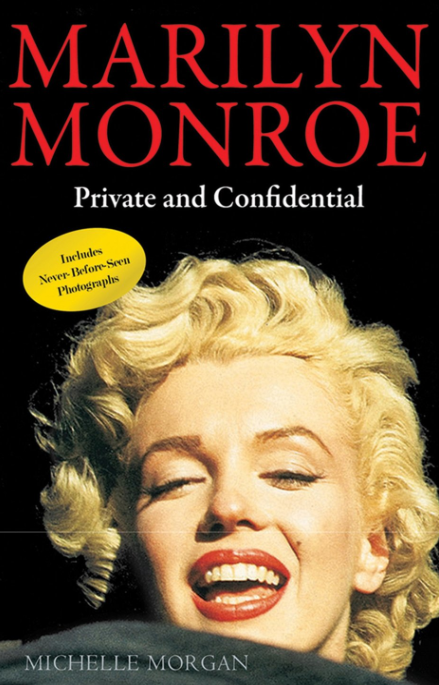 That’s why I wrote Marilyn Monroe: Private and Confidential, because I wanted to show people who the real Marilyn was. I loved writing that book and most people get what I was trying to do with it. There are a few who would rather I just talked about the Kennedys, death conspiracies, etc., but that’s their problem. I have no interest in embellishing her life. She was interesting enough without that. Michael: Tell me about your background. Were you born in the United Kingdom? With your interest in old Hollywood, have you ever considered moving to California? Michelle: Yes, I was born in the UK and still live here, very happily. I think maybe I flirted with the idea of moving to California when I was a teenager, but not anymore. I don’t like to be far from my family, but if anyone would like to buy me a house there, I’m sure we would very happily move there for the summer! I live with my husband, Richard, and daughter, Daisy, who are incredibly supportive of my writing and projects. We also have a dog, Betty, who is a little less supportive, as she insists on interrupting my writing time to try and bribe treats out of me! I had the best childhood you could ever hope to have; my parents were very happy; I had a younger brother who I adored (and still do! ); and very loving grandparents. When I was a teenager, I thought I wanted to be an actress and used to go on all kinds of auditions and courses. My hubby (who was my boyfriend at the time) used to go all over the country with me on my quest to become an actress, but when I was 21, I realised that, while I loved writing the application letters, I hated actually auditioning, so it kind of clicked that writing was what I really needed to be doing. When I look back, I have no idea how I didn’t know it sooner. I spent my entire childhood writing books and binding them together with string or staples; I used to write fictitious news articles; and would read for hours. I was a writer from the day I was born, but I was an adult by the time I realised it! 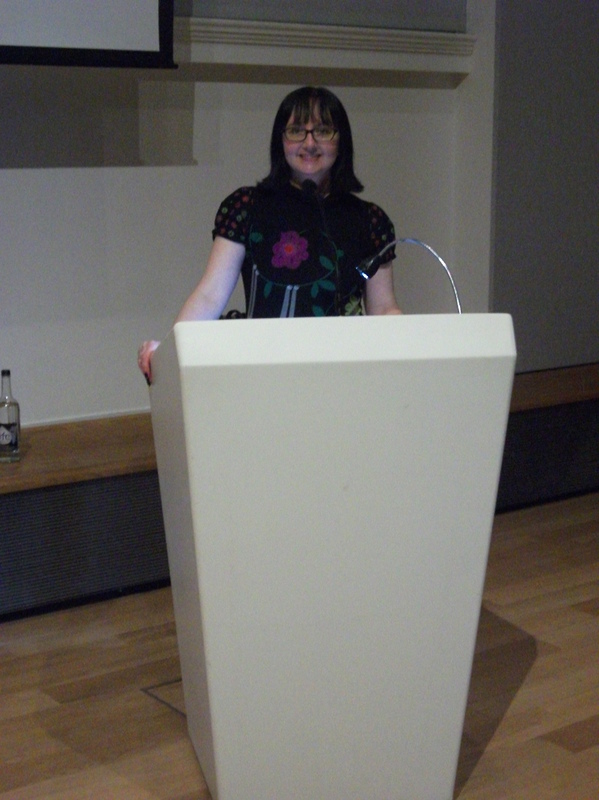 When I did realise that I wanted to be a full-time writer, I was working in a boring office job, with very little support from some of the people I worked with. I was desperate to leave but I was far too stubborn. I didn’t want to leave to go to another office job. I wanted to be able to say I was going to work on my writing career. After seventeen years of working there, my daughter was born and that changed everything. I wanted her to be proud of me and her arrival was a huge catalyst. I knew that I’d have to go after my dreams in a big way, so to help, I trained to be a children’s yoga teacher and then was able to leave the day job to run my business and pursue my writing. Michelle at a recent book signing. That was nine years ago and I’ve never looked back. I don’t teach yoga any more (except for one class for my daughter and her friends) and instead I spend my days doing exactly what I want to do. It has taken a long time to get here, but not a day goes by when I don’t thank God I’ve been able to do it. I am glad that I had to work so hard though, because now I appreciate each and every minute of my work and I’m honoured to be doing it. I just hope and pray that I’m able to do it for the rest of my life. Michael: What types of books do you like to read when you’re not writing? Michelle: I love many kinds of books, but adore biographies about golden age celebrities most of all. I loved your Mae Murray book! I bought it as soon as it came out, and it is still sitting next to my bed! As well as biographies, I also love Jackie Collins, and ‘chick-lit’ authors such as Jane Green, Lisa Jewell and Marian Keyes. 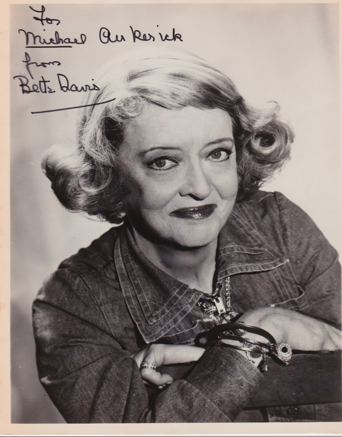 One of my own Bette Davis treasures. Michael: An admiration for Bette Davis is one we have in common. I think she is Hollywood’s finest actress. You collect items that once belong to her. Can you tell us about those treasures? Photos? You must have a cigarette holder, a tube of lipstick, or something like that! Michelle: Oh, I adore Bette. I have loved her since I was a teenager and discovered I was born on her birthday. When she died, I remember crying my eyes out because I felt such a connection to her and a real admiration that has grown even more so as I’ve become older. I love her so much, in fact, that my daughter’s middle name is Elizabeth, in honour of Bette. I tell her all the time that she was named after Bette Davis, and she seems quite proud of the fact, even though she doesn’t know much about her at this point in her life. I started collecting items that belonged to Bette purely by accident. It started off with me buying a signed book as a present for myself, after the success of my Marilyn book. Then I somehow got in touch with a man who knew one of Bette’s cousins. He told me that she had some of Bette’s own books and would be willing to sell them to me. I snapped them up and they came complete with Bette’s handwriting in one and her bookplates in all of them. Whenever I need to feel brave, I always go and pick up one of her books. It sounds silly, but I feel as though her energy is still on those volumes, and it gives me strength too. I hope to be able to collect more items she owned, one of these days. Michael: Thanks, Michelle, for spending some time talking about your books and writing interests. Let me know how your Thelma Todd book progresses. I’d like to talk with you again after its release. Michelle: I’d like to thank you very much indeed for giving me the opportunity to talk with you. Your blog is one of my favourites, and I’m honoured to be part of it. In the meantime, read more about Michelle through her blog. 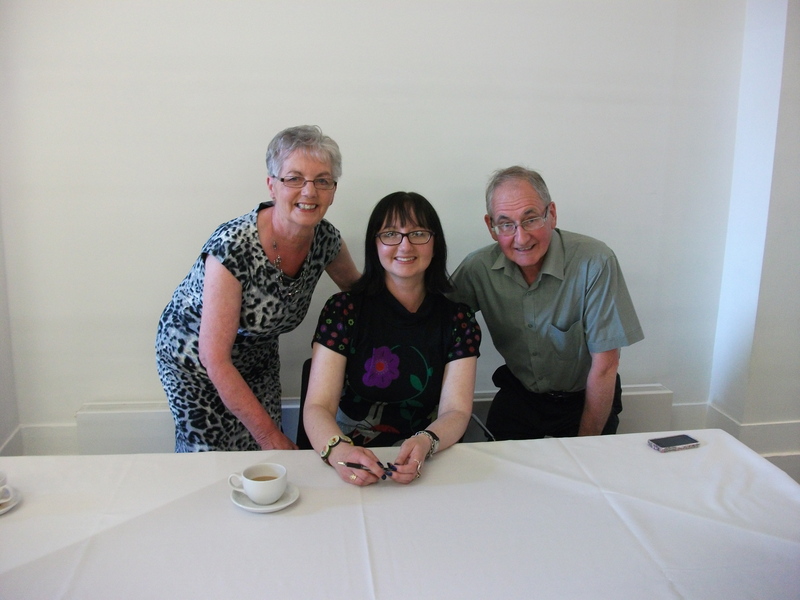 Michelle and her parents at a recent book signing.